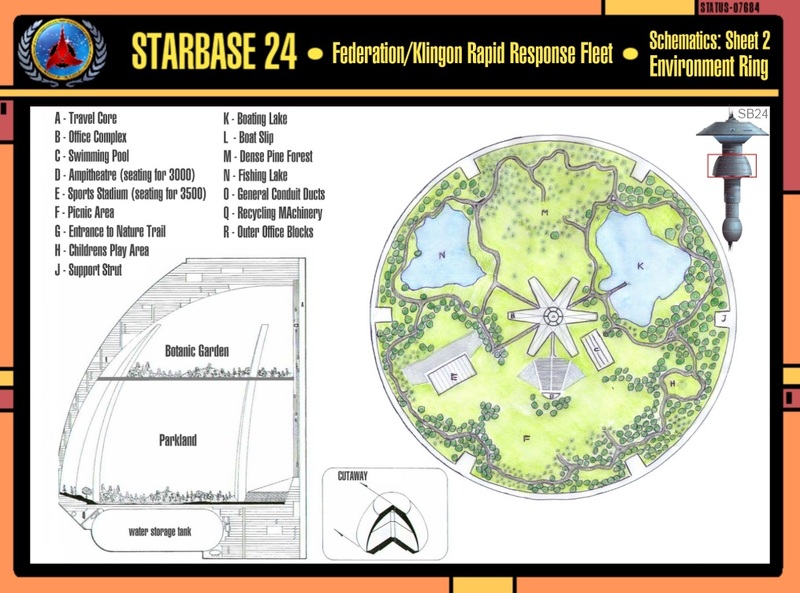 Orbiting Frontera, an earthlike, class M planet on the Federation/Klingon Border which has a 24 hour rotation period, Starbase 24 is able to maintain an Earth based time system. Although the base is mainly geared up for oxygen breathing occupants, the life support systems are able to be reprogrammed where necessary to provide suitable environments for beings with different requirements. 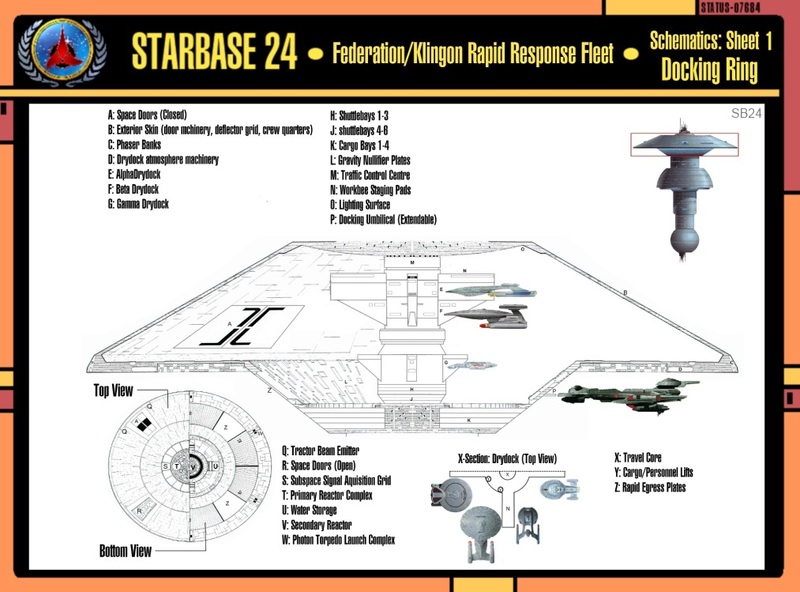 Decks detailed in red are restricted to Starbase 24 personnel only. 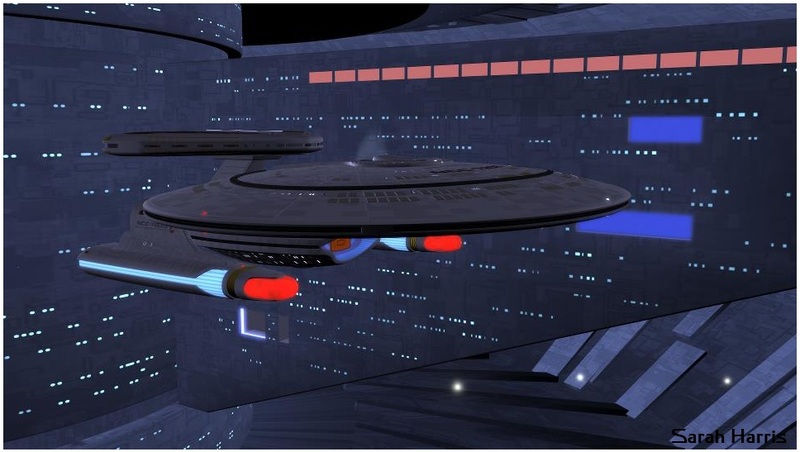 The uppermost 45 decks of the structure, much like a Federation Starship, comprise the ‘brains’ of the starbase. 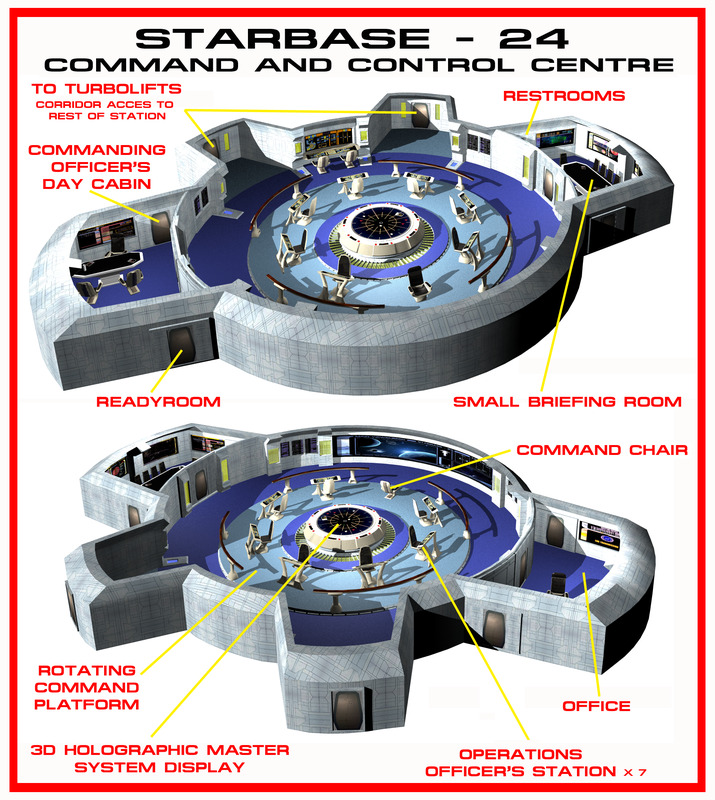 Command facilities such as Ops are located here, together with service meeting rooms, access to in-system and interstellar communications antennae and Commissary facilities for senior duty officers. 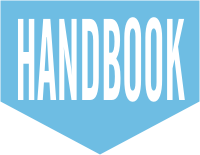 Like all sections, the Command Level also hosts a dedicated emergency medical ward primarily for triage prior to the transfer of a patient to the main hospital decks (if necessary). The Upper Space Dock is divided into two sections: the Core and the Outer Ring. As a whole it contains many facilities that make it reminiscent of a ground based Space Port. 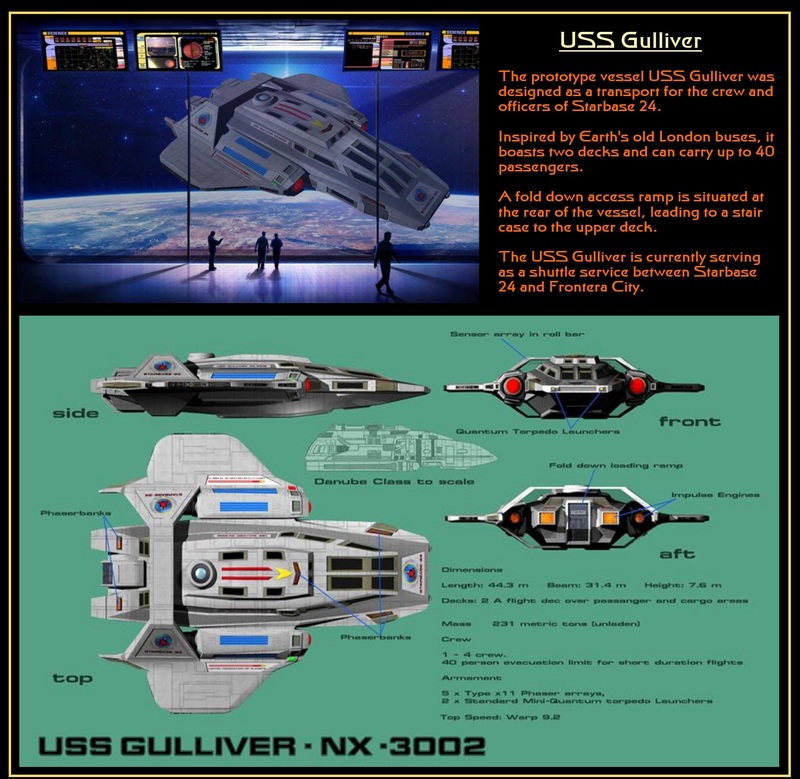 From hotels, hospitality services and shopping malls in the Outer Ring to the Vital services of the Core such as Space Traffic Control, Civillian Customs, Excise and Immigration are housed within the 150 decks of the Upper Space Dock. Transient quarters, hotels, shops, cafés, restaurants, offices, holosuites. The Lower Space Dock is divided between civilian and military use. Starfleet shuttle bays, Fighter docks and cargo storage space can all be found in the area of the Lower Space Dock. 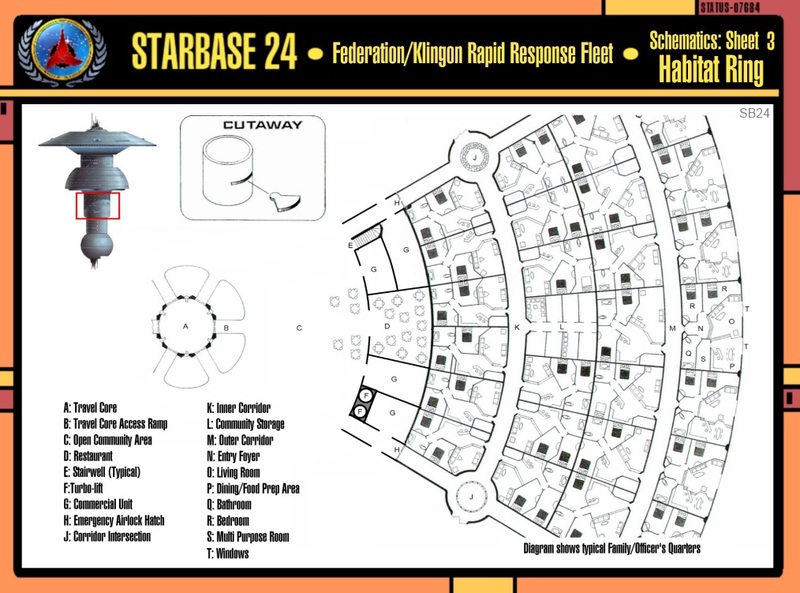 The Upper Utility Ring is primarily devoted to serving the commercial and leisure needs of both the permanent and itinerant residents of Starbase 24. The Starbase computer core is also located in this section. Much as the name suggests, the Environment ring is devoted to the environmental wellbeing of the starbase and its’ inhabitants. Most of the internal space is devoted to parklands, sporting facilities and educational establishments. Diplomatic staff assigned to Starbase 24 enjoy planet-side style office space with beautiful rural views. Both parkland and arboretum are designed with high ceilings to produce a feeling of being outdoors. Entertainment facilities – holosuites, cafes, restaurants, clubs, bars. 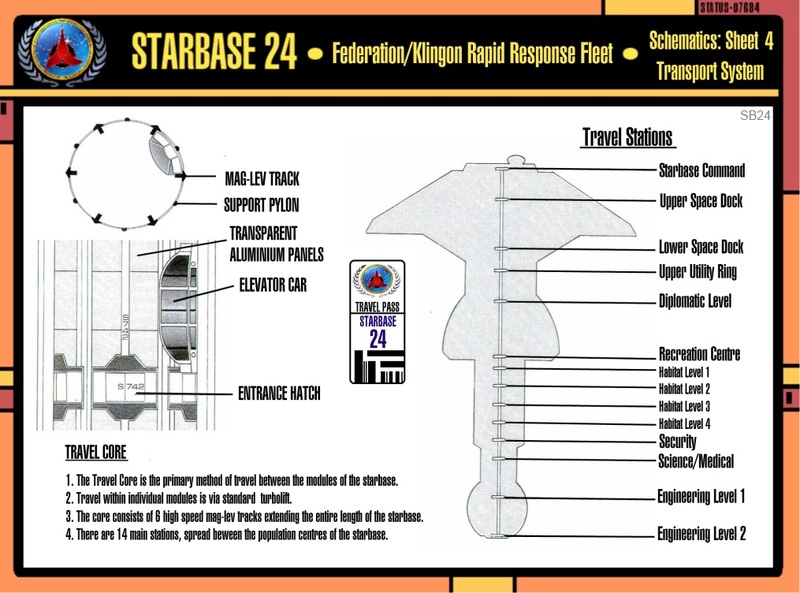 The Klingon Quarter of Starbase 24 is famed throughout the sector and is a popular stopping point for visiting Klingon crews as well as the personnel of permanently stationed vessels. Alongside the decks of the Klingon Quarter, JAG and public security offices are also located withing the Lower Utility Ring. The Station’s primary residential facility for those personnel who do not chose to reside and commute from planetside. Across 150 decks the Research Ring of Starbase 24 is a virtually self contained scientific and medical research and treatment facility. Hospital and Veterinary clinics share bulkheads with forensic science laboratories, computer sciences, geosciences etc. All known disciplines are catered for in this remarkably well equipped scientific research centre. Much of the engineering section of the Starbase is restricted access due to the sensitive nature of the work done there. However, the Planetary observation decks are open to all and contain a very good restaurant with spectacular views of the planetary surface. 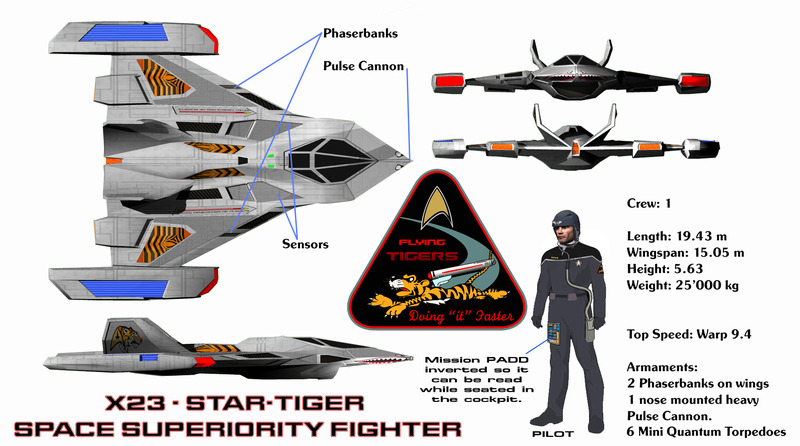 The travel core is the primary method of travel between the various modules of the Starbase. Travel within the individual modules is via a network of standard turbolifts. Each Mag-Lev car has three levels and holds up to 30 persons per level. Entrance to the car is via any level. Average travel time between the stations is 2-3 minutes. Total travel time from top to bottom is generally over 30 minutes although in emergency situations, deployment can be accelerated to under 5 minutes. 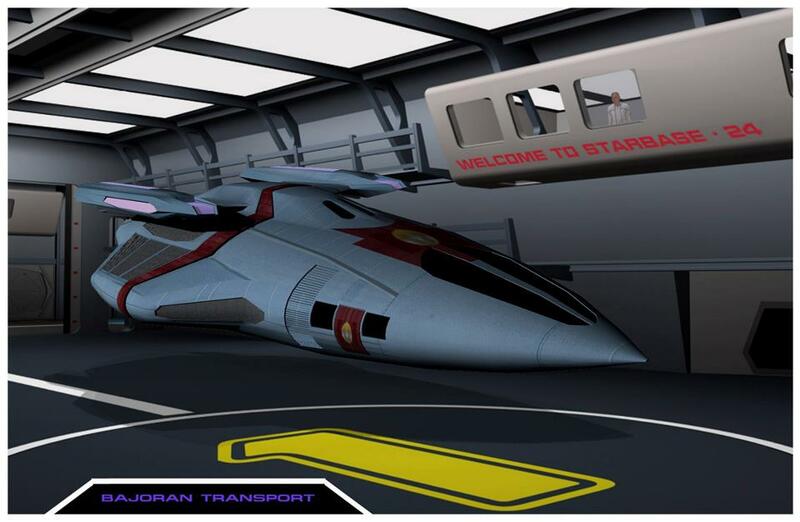 The timetable of each car is staggered and varies according to time of day, shift changes and starbase alert status. A travel pass is required to access the travel core services. Itinerant visitors from non Starfleet or allied military vessels do not have access to the travel core. 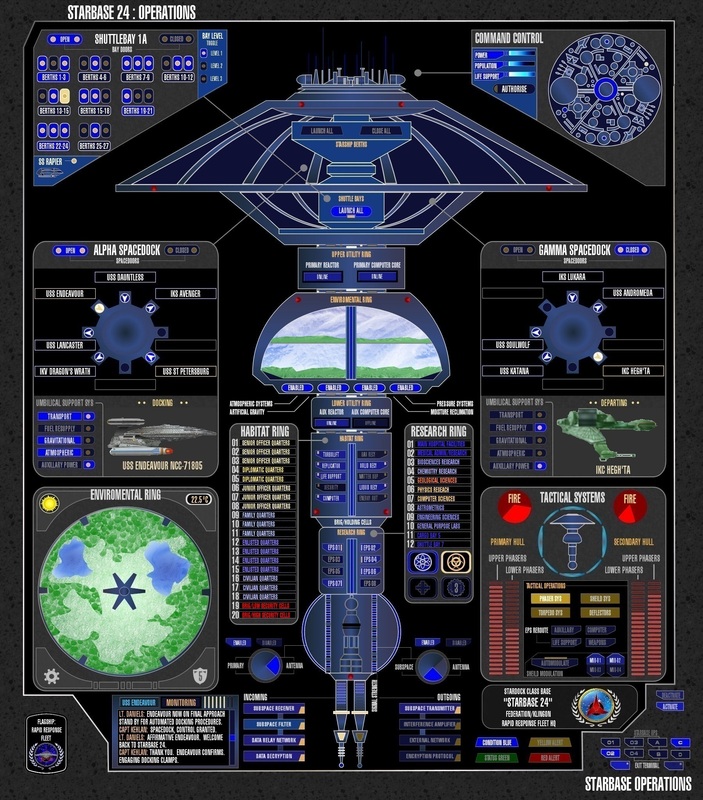 Starbase 24 utilises six mark 85 LCARS computer cores operating in tandem, providing superior capabilities for data compilation, research and data analysis. All of the cores are connected via a bio-neural network that can operate data transfer levels approaching 1000 teraquads of data per second. Specific details of the computer core design including technical specifications are classified. 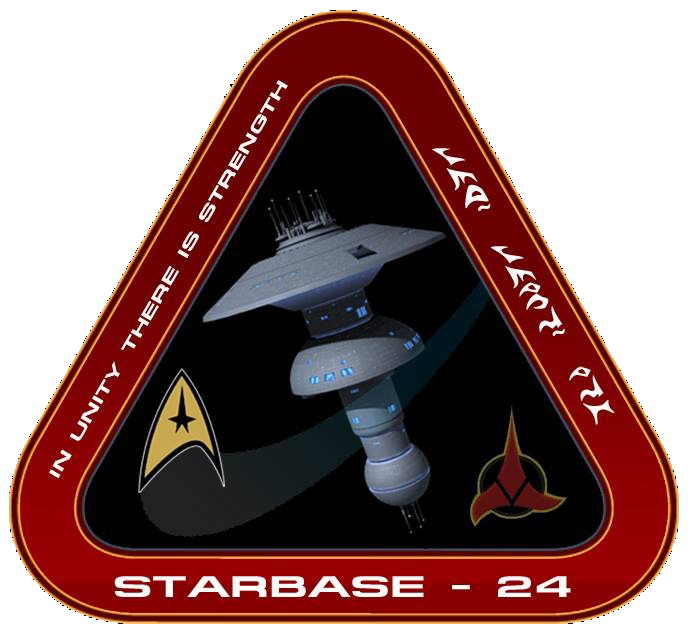 The Starbase computer cores are among the most advanced in the federation, considering Starbase 24's strategic location, the highest levels of data capability are not only necessary but essential, considering the vast amounts of data recovered from starship patrols and intelligence gathering operations needed for the defense of Starbase 24. The computer cores are located in the Upper Utility Ring. 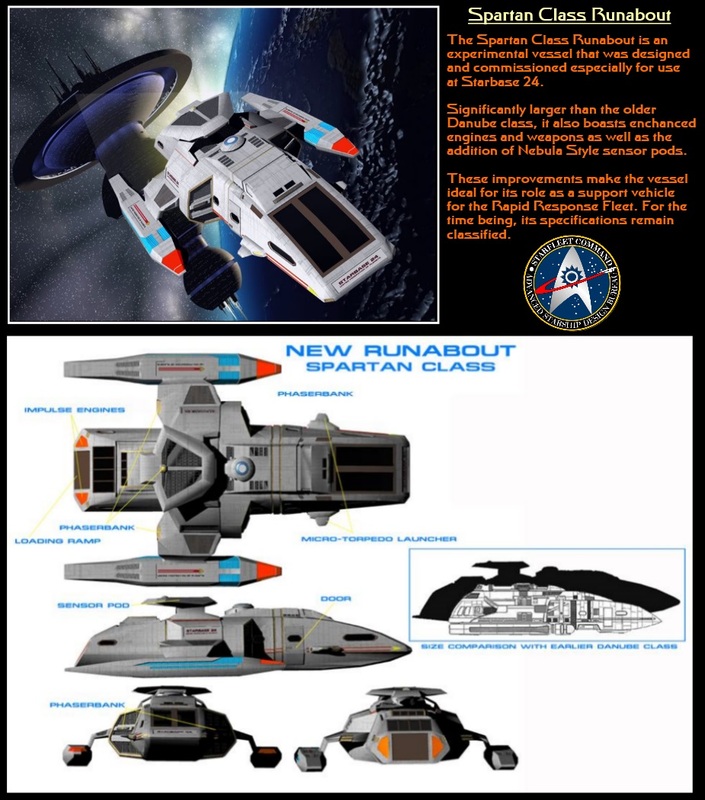 Schematics and text for the Deck Plans adapted from those of Starbase 79 with grateful thanks. 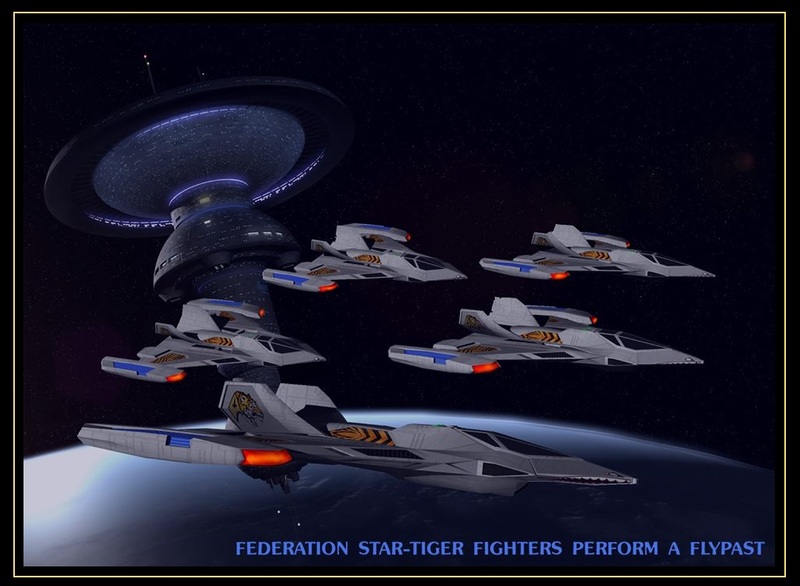 Please do look up Starbase 79 and pay them a visit. Thank you also to Kereth epetai Makura and Sarah Harris for the images they have created for this page.